When you click Apply on any window, the changes that you made to the device configuration settings are stored only in the Running Configuration. To preserve the parameters in the Running Configuration, the configuration must be copied to another Configuration File or saved on another device. IMPORTANT: Unless the Running Configuration is copied to the Startup Configuration or another configuration file, all changes made since the last time the file was copied are lost when the switch is rebooted. 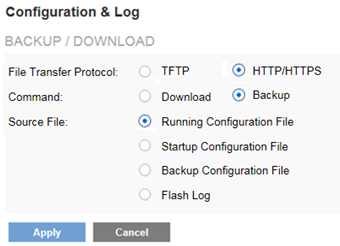 From the Running Configuration to the Startup Configuration or Backup Configuration. 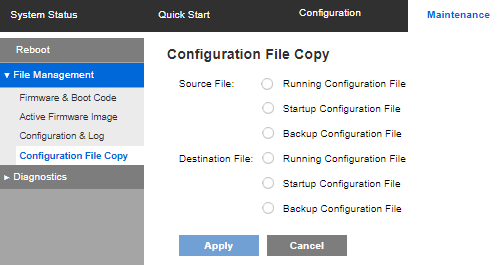 From the Startup Configuration to the Running Configuration or Backup Configuration. 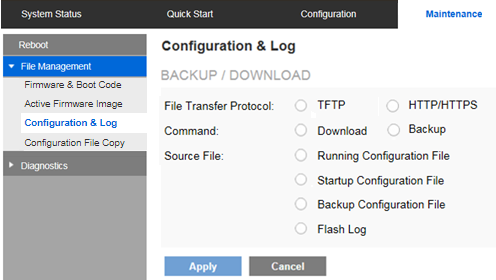 From the Backup Configuration to the Running Configuration or Startup Configuration. This article will provide you the instructions on how to back up the configuration file and save configuration changes on the Linksys Smart Gigabit Switch. Access the Linksys smart switch’s web-based setup page. To know how, click here. On the web-based setup page, click Maintenance > File Management > Configuration File Copy. 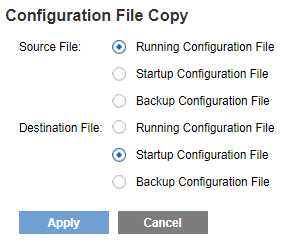 On the Configuration File Copy screen, select Running Configuration File for Source File, and Startup Configuration File for Destination File. NOTE: Unless the Running Configuration File is copied to the Startup Configuration File, rebooting the device will remove all changes made since the last time the file was saved. Save the Running Configuration File to the Startup Configuration File before logging off to preserve any changes you made during this session. On the web-based setup page, click Maintenance > File Management > Configuration & Log. 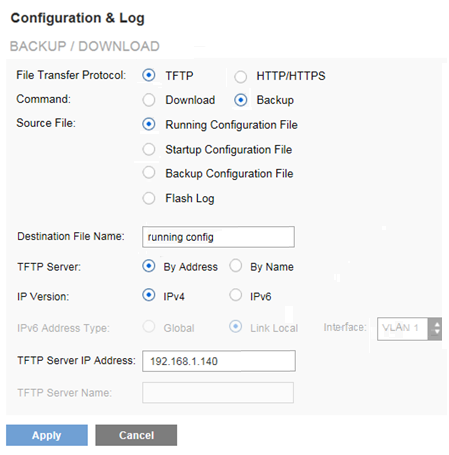 On the Configuration & Log screen, select HTTP/HTTPS for File Transfer Protocol, Backup for Command, and Running Configuration File for Source File. Save the config.txt from your switch to your computer. The running config.txt will be saved to the device of the TFTP server.